Any manga series which can say that it has been around for over eight years now can likely be considered successful in one way or another. One such manga series happens to be the Rosario + Vampire series. Originally stared back in 2004 by Akihisa Ikeda, the manga is still being published in Japan and Viz Media has been faithfully bringing complete volumes of the series to North American fans. 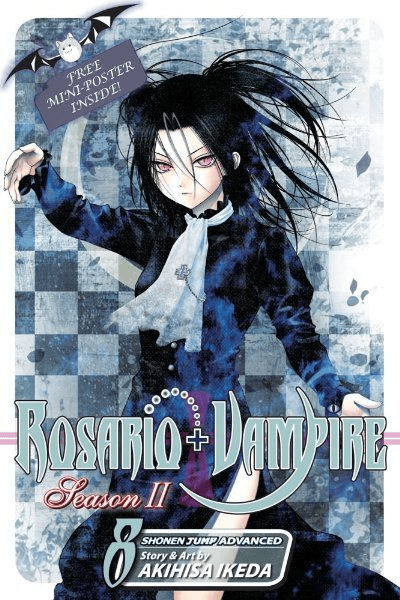 Back in 2007 the manga entered its second stage, or as it is now titled, Rosario + Vampire Season II. This second season introduced a number of more serious elements to the story of a human boy enrolled in a school full of demons. Does Rosario + Vampire Season II Volume 8 keep the romantic comedy element or is it time for some drama? In the previous volume Tsukune, Mizore and one of the Dark Lords, Tohofuhai were drawn into Moka’s seal when they were attempting to find a reason to repair it. Volume eight picks up immediately after volume seven, as Tsukune and the others are still trapped within Moka’s seal, learning more about her past and the true reason that the rosary was needed in the first place. They say that a good character needs a compelling backstory and while most of the girls who have gathered around Tsukune have had some elements of their characters explored, Moka’s past has mostly been left a mystery. Volume 8 reveals more information about a force capable of destroying the world if it were to ever be released, Moka’s mother as well as her elder step-sister Aqua. However while these three are trapped within Moka’s seal, the Huang household is under attack by the members of Fairy Tale. With a practically unstoppable force bearing down on the vulnerable Moka and Tsukune, Kurumu makes a desperate effort to bring them back and fight against what may be their greatest threat yet. As I mentioned before, a character’s backstory is always essential and one of the biggest mysteries in Rosario + Vampire was the origin of Moka and her rosary seal. Finally learning the reason that the seal was necessary and the events that unfolded which lead to her sealing was truly a heart-rending moment. While I may never be a fan of flashbacks, this volume has handled Moka’s backstory quite well and will leave fans eager to see what will happen in Volume 9 with a dark cliffhanger. One thing that Rosario + Vampire Season II excels at is impressive artwork. Whenever there is an action scene, many artists will skimp on certain background details or detailing attacks, however there is never a quality drop within the pages of Volume 8. Considering Volume 8 is roughly half action and half exposition, there are plenty of panels that contain full page illustrations of character’s crying out in anguish or panels detailing complicated looking attacks and enemies. Those who have looked at the cover above will note that Volume 8 contains a free mini-poster of Aqua standing before a moonlit window. The poster, roughly two pages in size, is a nice bonus and a good effort to push the newly rising character. It is also worth noting that Volume 8 is an extremely serious chapter however, so anyone looking for any kind of fan-service will be a bit disappointed that at most, there is only one panel of service for readers, though it is not flaunted at all so those who may be bothered by such an inclusion won’t need to be worried. As already mentioned, Rosario + Vampires Season II Volume 8 is a very serious chapter which spends a large amount of its roughly 180 pages exploring Moka and her seal’s origins. This means that there is very little actual comedy in Volume 8, though the romantic element does take a bit of a step forward with one character finally admitting their feelings aloud. This volume does an excellent job exploring Moka’s backstory with a number of exciting battles, though those hoping to see some of their favorite characters in action will be disappointed that most of the main cast are bystanders this time around.